Bonds are usually less volatile than stocks and are often used as a way to help diversify a portfolio and potentially mitigate risk. 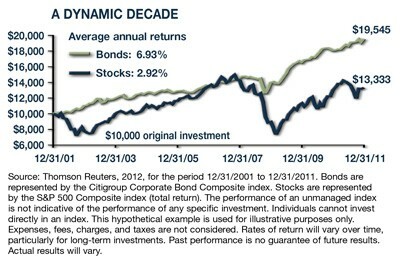 Bonds also tend to offer lower total returns than stocks over the long term, although corporate bonds outpaced stocks by an average of 4% per year during the 10-year period from 2002 through 2011 (see chart). Of course, this period included some tough times for stocks, and interest rates have been unusually low, which tends to increase bond prices. Also keep in mind that past performance does not guarantee future results. If interest rates rise over the next few years, bonds could return substantially less than stocks. Even so, the last decade demonstrated that sometimes bonds can be the bulls. When you purchase a bond, you are lending money to the bond issuer in exchange for the issuer’s promise to repay the loan amount plus interest at a future date. Bond maturities typically range from 30 days to 30 years. 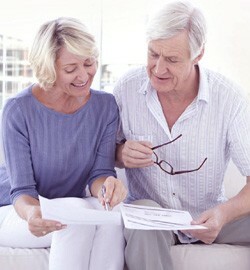 Bonds are issued by federal, state, and local governments and by corporations. U.S. Treasury bonds are generally considered to be among the safest investments, despite the recent downgrading of the U.S. credit rating, because U.S. Treasuries are guaranteed by the federal government as to the timely payment of principal and interest. The return on municipal bonds tends to be lower than that of federal bonds; however, the interest on bonds issued by your own state or local government is typically free of federal income tax. Another way to incorporate bonds into your portfolio is by investing in bond mutual funds. There are almost 2,000 bond funds available, representing about 25% of all mutual funds.2 They are subject to the same inflation, interest-rate, and credit risks associated with their underlying bonds. Bond funds generally can be bought and redeemed more easily than individual bonds and have no specific maturity date. In addition to helping diversify a portfolio, bonds can be used to help generate a regular income stream. The principal value of stocks, bonds, and bond funds will fluctuate with changes in market conditions. Shares, when sold, and individual bonds redeemed prior to maturity may be worth more or less than their original cost. Diversification does not guarantee against loss; it is a method used to help manage investment risk. In some states, investors have to pay income tax if they buy shares of a municipal bond fund that invests in bonds issued by other states. 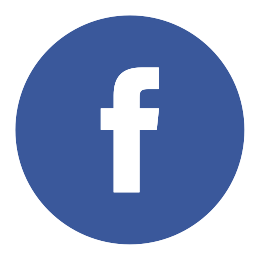 Although some municipal bonds in a fund may not be subject to ordinary income tax, they may be subject to federal or state alternative minimum taxes. If a tax-exempt bond fund is sold for a profit, investors could incur capital gains taxes.